It’s every girl’s dream. A wedding dress search that’s uninhibited by price. And complete with stylists offering suggestions and designers creating custom gowns. Really, it’s a wedding dress search that’s all about the bride’s vision, with no compromises required. With that exquisite luxury in mind, it’s no wonder celebrity wedding gowns are so jaw-droppingly beautiful. We’ve looked back at 2012 and picked our favorite celebrity wedding gowns. Which is yours? Featuring an elegant off-the-shoulder neckline and a voluminous tulle skirt, Anne Hathaway’s Valentino gown was definitely one of the most memorable of 2012. With just a hint of pink at the hemline the dress is both modern and classic at the same time. 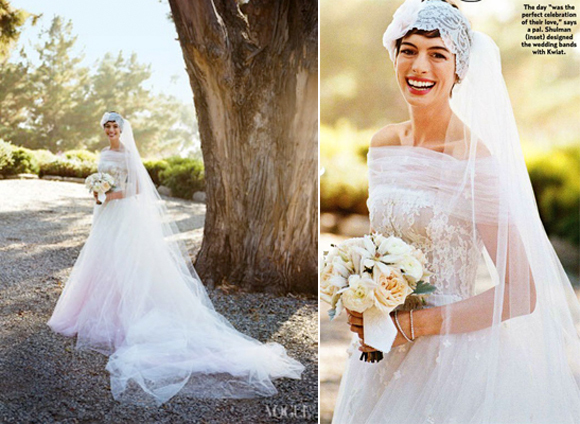 And the gorgeous lace headband and veil were the perfect accessories. 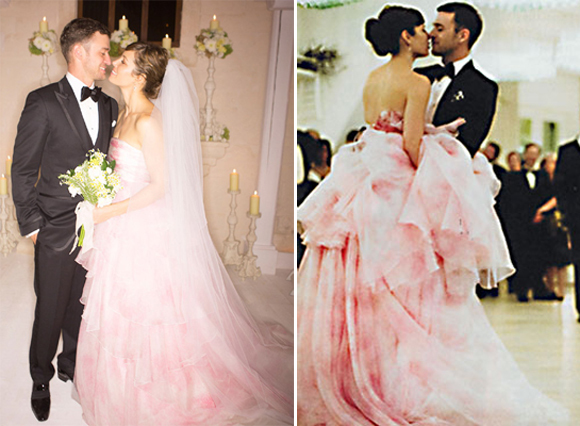 Jessica Biel surprised everyone with her romantic petal pink Giambattista Valli strapless ball gown. The gown was equal part whimsy and drama and the perfect choice for her Italian nuptials. We love how her veil included pearls from her grandmother’s wedding tiara. Such a sweet tribute. Courtney Mazza wore a ultra romantic Ines Di Santo gown for her Mexican wedding to Mario Lopez. The off the shoulder fit-and-flare gown had a pink underlay and a dramatic bow at the back. Courtney’s two year old daughter, adorably, also wore Ines Di Santo for the big day. Camila wore a gorgeous long sleeved lace gown with delicate beading. The romantic dress was created by Brazilian designer Ducarmo Catelo Branco and made with only one fitting. A diamond headpiece and lace mantilla completed Camila’s elegant look. Hilaria Thomas chose her Spring 2013 Amsale gown in a single visit. The dress’ chic simplicity was the perfect compliment to Hilaria’s down to earth personality. Her gorgeous mantilla was the perfect accessory and a tribute to her Spanish roots.